Stress resistant, straight frame offers maximum shock absorbing and durability. Dual Grip Vinyl. 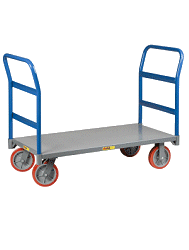 Total hand truck height with this handle is 48". Great hand truck handle. Extruded Aluminum 18" wide x 9" deep. Industrial Strength! Full Pnuematuc 4 ply 10" wheels. 2-piece hub, zerk fittings and all ball baerings. Stair Glides - Cast aluminum have low friction acetal skids bars. Great for moving over stairs and curbs. Bonus: 60" Frame Extension - Total truck height 60"